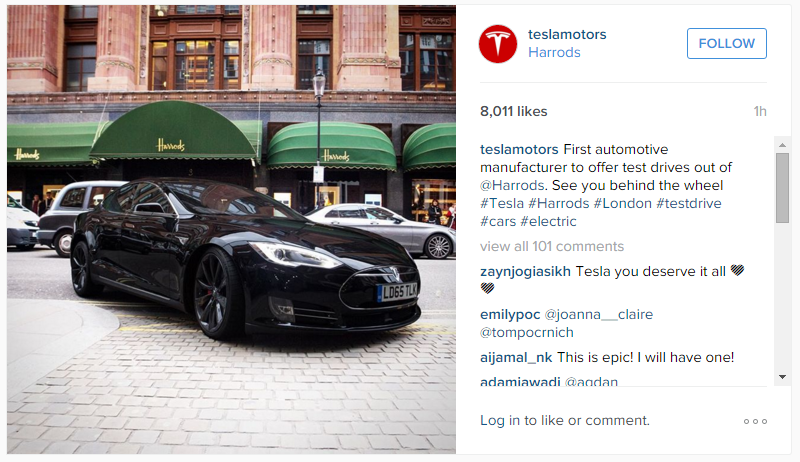 Tesla announced today via Instagram that the company now offers test drives out of Harrods, a popular upmarket department store in London. The company claims to be the first automotive manufacturer to offer test drives out of the store. The location has been popular in the past with high-end car manufacturers such as Rolls-Royce, Aston Martin and even Fisker, but they seem to have only displayed their vehicles at the store without necessarily offering test drives, which means Tesla’s claim might stand. On its website, the company lists a “Pop-up Store” location at the store on Brompton Road. Based on registration data, Tesla delivered 541 cars in the UK during the firs 9 months of the year, making it a relatively small market for the company in Europe, but some expect Tesla’s sales to significantly increase in the country. Credit Suisse analyst Dan Galves recently predicted an incremental sale increase of 1,000 units in the UK versus the third quarter 2015. In related news, Tesla also recently hired a former Apple store architect working from London.